This client originally called me for a silk press. 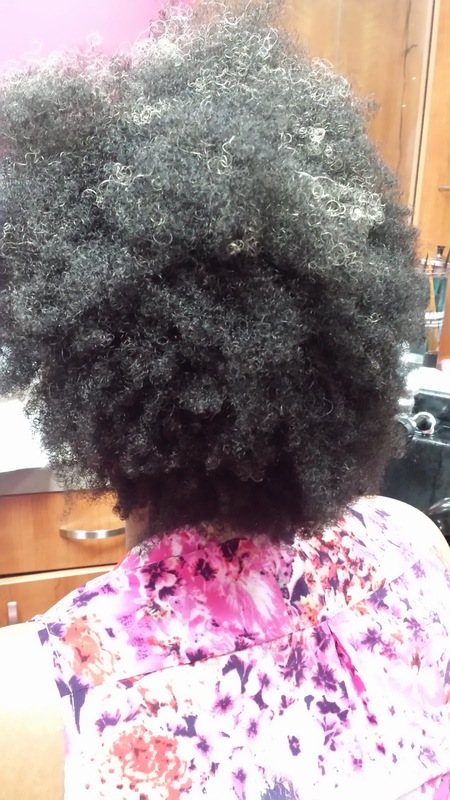 She wanted to wear her natural hair straight but did not want to relax it. However, she works out on a regular basis and sweats profusely in her scalp. 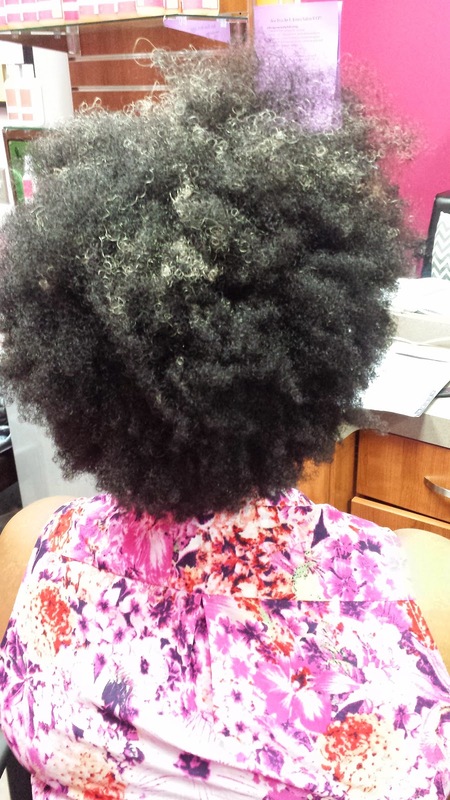 So, especially during the summer months when lots of perspiration can occur, it is not a perfect time to get a silk press if you tend to sweat in your scalp. However, you are still in luck because there is another option for all of you natural ladies out there! Keratin treatments allow you to have straight hair for up to four months. During that period of time your hair will gradually return to its natural state and by the end of your four months your hair will completely return to its natural state. So, with a relaxer you only need to retouch the new growth, but with the keratin treatment you have to do all of your hair over again because it will wear completely off. 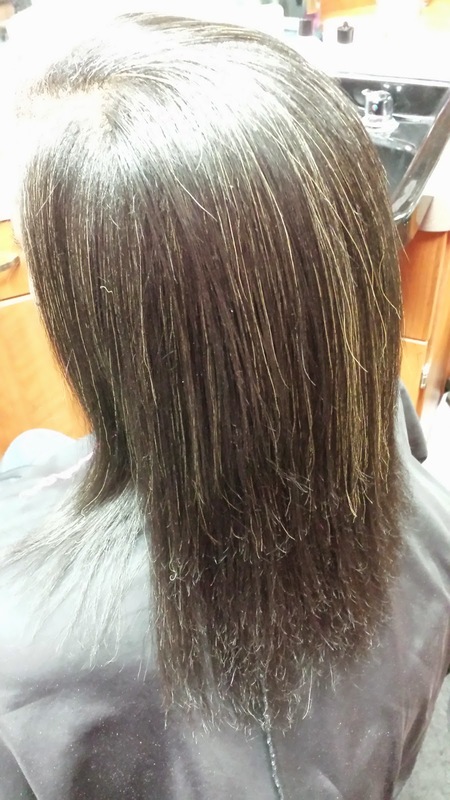 It allows you to test out having straight hair without the commitment of a permanent relaxer. If you just get the urge to have straight hair for a while but you also want to keep your curly locs you will have the assurance that they will come back again without you having to completely transition again as you would if you let your relaxer grow out. The way the keratin treatment is applied is that you take small sections of hair and comb it through. 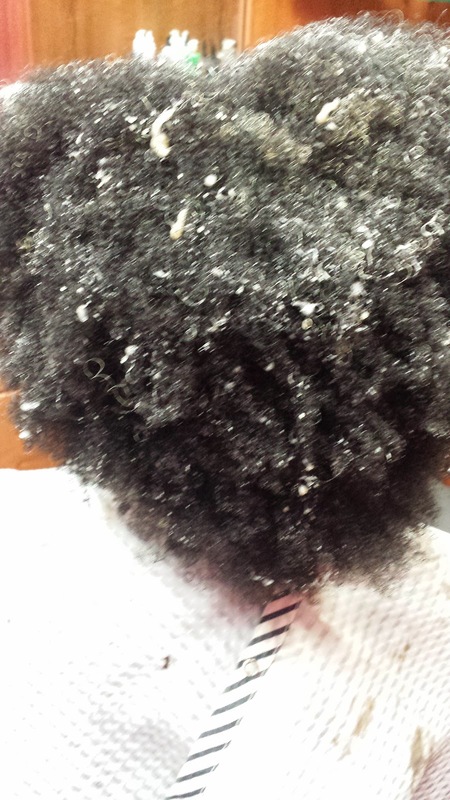 It is very similar to doing a virgin relaxer because you bring it all the way to the ends of the hair. It is not a chemical though so no worries about burning or anything like that. Once it is completely done, you can let it sit for a few minutes to process. 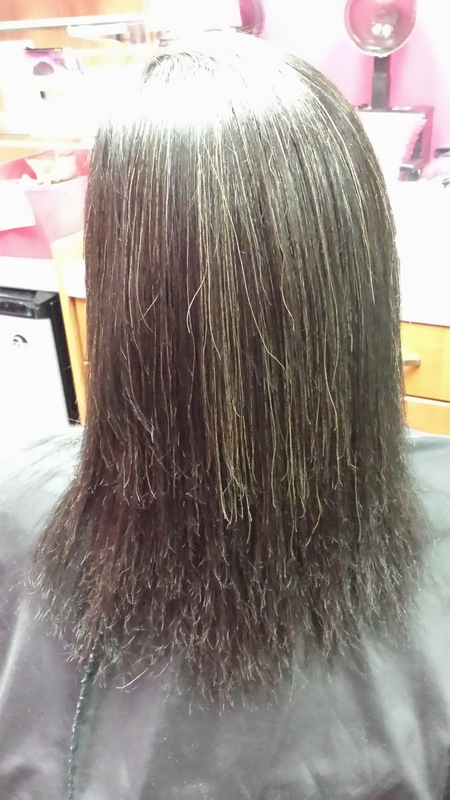 After it is processed the hair is then blown dry completely before flat ironing. Once all of the hair has been flat ironed, you then can enjoy having frizz free hair! The above picture is right after I got the hair blown dry. You can already see how straight the hair is before I even flat ironed it in. The pic below is after it is completely flat ironed and done. The hair was so straight and silky smooth to the touch. She was very pleased with her hair. I also trimmed her ends as well to make the hair look perfect. She has not had a trim in over a year so it was well over due. 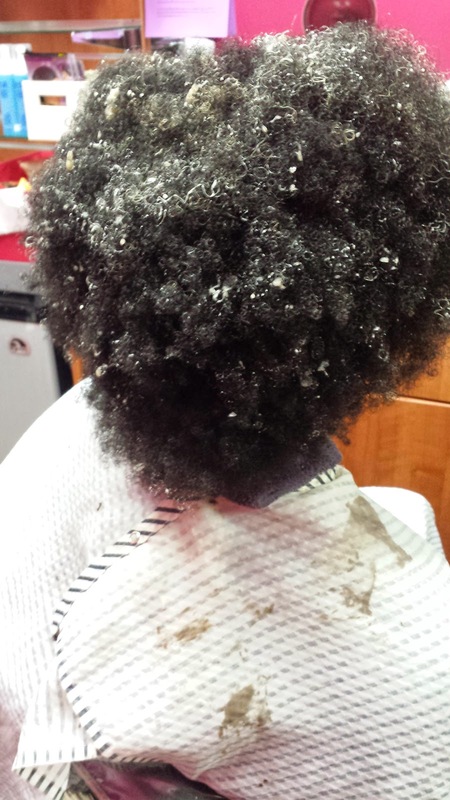 Once again, every time the hair is shampooed, the treatment will gradually be wearing off. Over the months she will notice her hair becoming a little bit curlier and curlier until eventually all of the treatment will be completely gone from the hair. If results are favorable, you can opt to get the treatment again. Or, you can then simply enjoy your curls again. 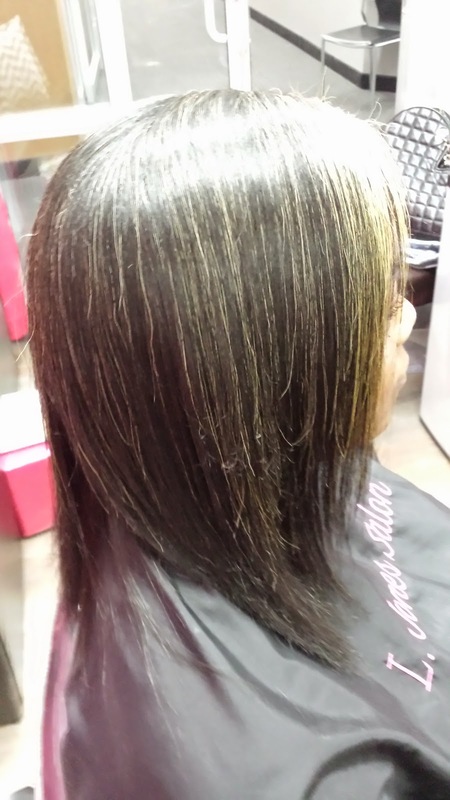 If your hair easily reverts back after you get a silk press, you will be a good candidate for a keratin treatment. Also, with a silk press, your hair will go back curly as soon as you shampoo your hair again. The main benefit of the keratin treatment is that you will not be a slave to the weather, temporarily anyway. Also, when you shampoo your hair, it will be much easier to comb, detangle, and style because it will be straight. Be advised that keratin treatments are to be done in the salon only! Do not attempt to this yourself, but instead allow a trusted hairstylist to do it for you. You can however, do the upkeep in the comforts of your own home. Yay! What a timely post. I'm 6 months into my transition and I have an appointment for a keratin treatment in 2 weeks. This makes me that much more excited. Which keratin treatment are you using? Love the shine on the hair but It seems like it still leaves the ends a bit frizzy. Is that the camera only? 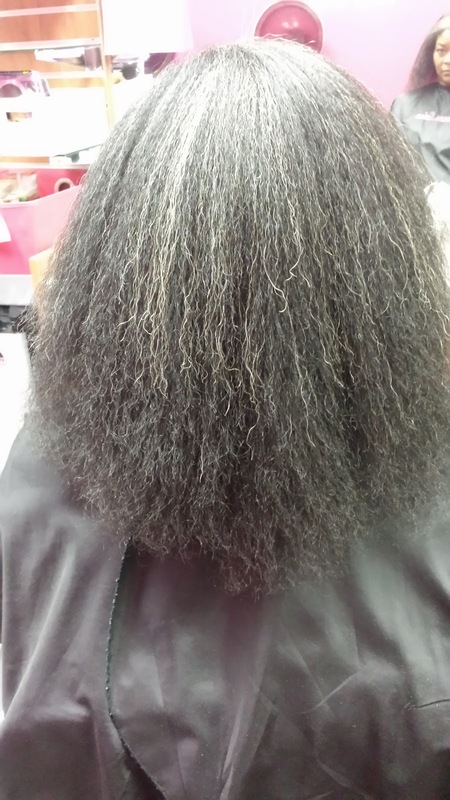 Her ends need to be trimmed more but she was not ready to have such a large amount cut at one time..
Did you use your silk hydration products b4 applying keratin? Do you offer a keratin trx in your line? No, when doing a keratin treatment I use that entire line. Same applies to relaxers. No Silk Hydration used for this..